Wow, I am really sorry I had to miss this discussion, because it was full of great links, resources, stats and opinions on creating apps for Android, from people who have been there. Luckily for me, though, I have access to this transcript (just like you) which contains a rather plain but complete capture of the entire thing. So I can benefit from last night’s wisdom, almost as if I was there in person! 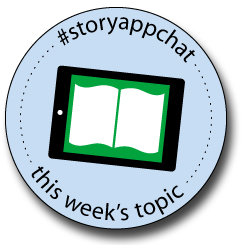 Don’t miss the next #storyappchat on June 2, when we’ll discuss the pros and cons of skeuomorphic interfaces. Details later, but plan to join us at 9:00 p.m. Eastern/6:00 p.m. Pacific! When was the last time you updated your iTunes app (or iBook) description? It may seem like a no-brainer, but this blank canvas of text can help interested people get a better idea of what your app is all about, or it can leave folks scratching their heads in confusion. How long should it be? What should be included? Let’s use the next #storyappchat to discuss what should and shouldn’t go into your iTunes description, how often it should be updated, and other ways to make this valuable developer tool lead to increased sales and happier users. We’ll ramp things up this Sunday evening (May 19) at 9:00 p.m. Eastern/6:00 p.m. Pacific time, so don’t miss it! Informative chat last night, which was strengthened by folks like Jon Smith (@theipodteacher) sharing why he’s chosen an ebook created with iBooks Author as the big writing project he assigns the kids in his EC classroom. Several other folks posted good, thought-provoking questions, and still more shared links and other wisdom with the group last night. Weren’t able to join us? It’s all there in the transcript above–I hope you find it useful. Make plans now to participate in the next #storyappchat, when we’ll talk about the Kindle format, and its suitability as an app substitute (or complement). See you this Sunday evening (April 28) at 9:00 p.m. Eastern/6:00 p.m. Pacific.